Keny Arkana is a French rap artist. She is active in the alter-globalization movement with "La Rage Du Peuple," a collective (cf. English "clan" or "crew") formed in 2004 in the Noailles quarter of Marseille, and takes a clear stance against capitalism and fascism. She sympathizes with the Zapatistas in Chiapas. Born in Marseille of Argentine heritage, Arkana began rapping in 1996. She formed the collectives Mars Patrie and later Etat-Major, gaining performance experience in the Marseilles underground scene, culminating in the 2003 release of Etat Major's first mixtape. Born in Marseille of Argentine heritage, Arkana began rapping in 1996. 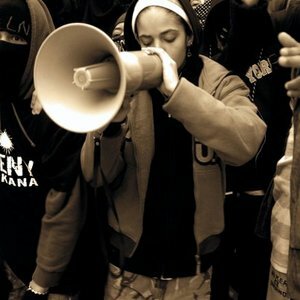 She formed the collectives Mars Patrie and later Etat-Major, gaining performance experience in the Marseilles underground scene, culminating in the 2003 release of Etat Major's first mixtape. After several solo appearances on various projects, Arkana released her first EP "Le Missile est Lanc?". Her first album "Entre ciment et Belle Etoile" was released in October 2006. Her first single, "La Rage," released in 2006, pointedly references the French civil unrest of 2005.